Justin Lofton enters the SFP 250 second in the NASCAR Camping World Truck Series (NCWTS) driver point standings, just six points out of the top spot, after a stellar start to the 2012 season. Lofton, driver of the No. 6 College Complete (http://www.collegecomplete.com, 877-543-2655) Chevrolet Silverado, enters this weekend's race at Kansas Speedway with momentum and optimism on his side. I am so excited about the position we are in. It's early, but I can't say enough about this College Complete team," Lofton said. "I like Kansas, and we are taking one of my favorite trucks. I'm really looking forward to this one. Justin Lofton enters the SFP 250 second in the NASCAR Camping World Truck Series (NCWTS) driver point standings, just six points out of the top spot, after a stellar start to the 2012 season. Lofton, driver of the No. 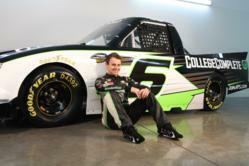 6 College Complete (http://www.collegecomplete.com, 877-543-2655) Chevrolet Silverado, enters this weekend’s race at Kansas Speedway with momentum and optimism on his side. The 26-year-old racer has tallied a top-10 in each of the three races run so far, equaling his season total for all of 2011. Lofton has two previous NCWTS starts at the 1.5-mile Kansas Speedway, with a best finish of 13th. Last season, he logged his first competitive laps led within a NASCAR race, leading the truck field for seven laps. Additionally, Lofton started the 2009 ARCA Racing Series event at Kansas from the pole, led a dozen laps, and crossed the finish line in the second position. This week he will be racing chassis 060 out of the Eddie Sharp Racing (ESR) stable. Last season, Lofton raced the truck at Kentucky and Las Vegas, notching a best qualifying effort of fifth and finish of 11th. In addition to the momentum that is on the No. 6 team’s side, they will also have a few extra fans cheering them on during Saturday’s event. Lofton, crew chief Dan Bormann, and the entire College Complete team will make the trip to Kansas a little early in order to visit soldiers at Fort Riley. Following the Thursday meet and greet with the service members and their families, many of them will attend the race. Partnered with hundreds of educational institutions and across all types of education goals, including traditional college degrees, trade and vocational certifications, and professional licensure, College Complete helps students assess all of the information that exists in the public domain, allowing them to understand and make sense of their educational opportunities. Their services are free and available to anyone. Whether you are interested in Art and Design, Business, Computers and Technology, Criminal Justice, Education, Healthcare and Medical, Science and Engineering, and much, much more; if you’re an Electrician, a Nurse, an Automotive Mechanic, a Teacher, a Police Officer, or you’re simply interested in learning Computer Programming, Networking, Web Development, or Graphic Design College Complete is available for you at no cost. You can reach them by filling out a form on their site or calling to speak with your personal Education Advocate at 877-543-2655. College Complete has an initiative to assist those in the US Armed Forces and their families and is able to assist in identifying schools that will not only provide the educational requirements of the soldier, veteran or family member but will do so in a cost effective manner.You can reach them by filling out a form on their site or calling to speak with your personal Education Advocate at 877-543-2655. College Complete has an initiative to assist those in the US Armed Forces and their families and is able to assist in identifying schools that will not only provide the educational requirements of the soldier, veteran or family member but will do so in a cost effective manner.